Let’s play a game: what natural product is not only hailed as a superfood for health benefits but also the answer to nearly all beauty topics? You guessed it–coconut oil! Coconut oil is the queen of all oils, and can seemingly do no wrong. Not only is the oil great for cooking, but it is the answer to many problems such as dry and irritated skin, stubborn eye makeup, damaged cuticles, and our very favorite: hair care! I have personally had issues with a dry scalp which has seemingly been a recurring problem even with using traditional treatment. However, coconut oil has made a drastic difference for me since I started using it. Because of my success with using it, I wanted to share my enthusiasm with you, and hopefully, you’ll have a great story to tell as well. In this article, we’ll be discussing the variety of benefits of coconut oil on hair, giving thoughts on if coconut oil is bad for your hair and more! What Kind of Coconut Oil is Best For Your Hair? How Often Should You Put Coconut Oil in Your Hair? First off, let’s address whether coconut oil is bad for your hair. The answer is simple: no, it most certainly isn’t. Coconut oil can actually help boost the health of your hair, provide it with nourishment to heal damage, and moisturize your scalp as well. Coconut oil is completely natural and rich in fatty acids, proteins, vitamins, and minerals. Applying coconut oil to your hair is comparable to giving your face a nourishing spa treatment. It’s safe, and it’s effective! When you are browsing store aisles for coconut oil, don’t let marketing catch you off-guard. There is no particular “kind” of coconut oil that is better for your skin, hair, and nails as opposed to what you’ll see advertised in the beauty or health aisles. As long as it is pure, 100% coconut oil, you’ll be good to go. Take a look around the food aisles instead, where you’ll likely find a large jar of coconut oil for far cheaper than in the beauty or health aisles. This will work just as well, considering the only difference is marketing and price. Our suggestion would be to veer toward organic coconut oil so your skin and hair aren’t exposed to any of those damaging chemicals. My personal favorite coconut oil is the Spectrum organic and refined oil, simply because not only does it come in quite a large quantity, but as it is refined, it doesn’t smell or taste like coconut, which is great if you’ll be using it in various recipes as well–after all, a little goes a long way, so a container is bound to last a while. You may be wondering if you can put coconut oil in your hair every day, and we’re happy to say that it can be applied as often as daily without any harm. Of course, it is an oil, so there is always the chance of it blocking your pores, which may cause the formation of acne. Because of this, daily use should be light while heavier uses should be followed with a shampoo treatment. It is quite a popular preference to use coconut oil as a hair mask at least once a month if not once a week. To use coconut oil as a weekly or monthly hair mask, simply take about penny-sized amounts of oil, carefully rub it between your fingers to liquefy, and work it into your hair. Begin at your roots, being sure to massage your scalp as you go. Once your roots and scalp are covered, work the coconut oil down your hair strands, paying close attention to your dry ends. For daily use, you’ll want to use a much smaller amount to prevent your hair from feeling too oily. Due to its popularity in beauty, you must be guessing by now that there are numerous benefits of coconut oil for hair treatment. The pros of applying coconut oil to your strands go much further than adding shine (though, who couldn’t use a little extra glow? ), and extends to the health of your hair follicles themselves. The seemingly simple task of working coconut oil through your hair, tying it up in a bun, and covering it overnight with a disposable cap boosts your hair’s strength and resilience far more than you probably realize. Let’s take a look at these benefits. Split ends have to be the bane of all us attempting to grow our hair long. It seems like every time we turn around, we have to trim our hair again. Though we know this will eventually help nourish our hair more and produce greater length, the waiting game is a difficult one. Thankfully, that’s where coconut oil comes in. Coconut oil is enriched with vitamins, fatty acids, and protein–all of which are necessary for helping your hair’s growth. When you apply coconut oil to your hair, the oil penetrates your hair shaft down to the follicle, coating it with the fatty acids and protein it needs to repair any previous damage. 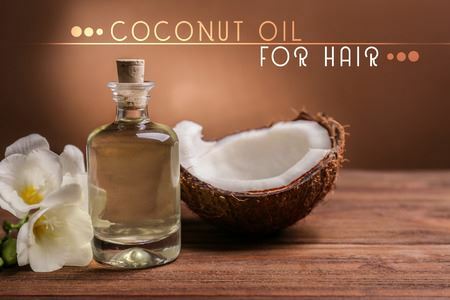 As the coconut oil helps with split ends, in time, hair growth is typically a visible result. Your trips to the hair stylist can be a little farther apart now that your split ends won’t be as much of an issue. 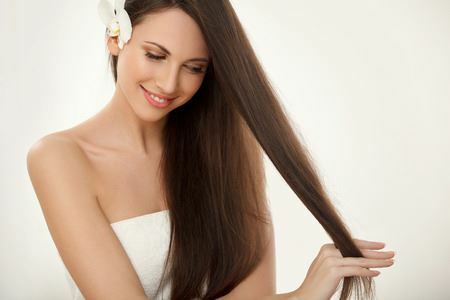 Without the split ends, your hair strands will actually retain their length so you can see the hair growth! The hair growth factor is twofold, because coconut oil nourishes your roots as well, which will now have the nutrients they need to heal any damage, target weak areas, and put more focus into growing rather than reviving dead ends. Though coconut oil for hair loss has been speculated as effective, there aren’t any studies proving it. Of course, since it can help with hair growth, it doesn’t hurt to try. To help your damaged hair, simply apply coconut oil as a hair mask before bed, both ensuring your strands are covered as well as your massaged scalp. Cover with a hair cap and wash with shampoo in the morning. As always, follow the shampoo with a high-quality conditioner to lock in the moisture provided overnight by the oil. Dandruff isn’t necessarily considered hair damage, but rather simply an affliction which many people experience. If you have ever had or perhaps even currently struggle with dandruff, then you know it can be a real issue. Not only does everyone who happens to see it or hear about it makes assumptions about your hygiene, but it feels like no one understands. Meanwhile, you’re dealing with an itchy scalp and flakes on your clothing. It’s not something you can help, and despite your best efforts, dandruff shampoo, at best, tends to just keep the problem at bay. 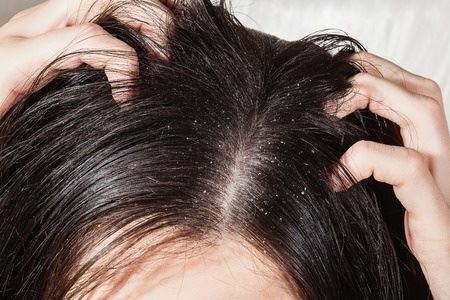 Dandruff is caused by a variety of different issues and opposed to what the vast majority of people think, it’s not always caused by a fungus. It can be, but it can also be from harsh chemicals and dry skin conditions. To help minimize the stress that dandruff brings, try treating it with coconut oil. With all its hydrating properties of rich fatty acids and vitamins, it makes sense that coconut oil could be a great contender for dandruff treatment. Most people may think of it only as an aid for your hair itself, however, it can greatly improve scalp health as well with its antibacterial and antifungal abilities. Additionally, it is rich in antioxidants which aid in keeping free radicals at bay–and yes, that’s even important for your scalp despite how densely it is covered with hair. Coconut oil has actually been used for hundreds of years to help with treating dandruff. As with all natural treatments, using coconut oil to help your dandruff won’t exactly produce overnight results, but you should start seeing a difference in a couple of weeks. If coconut can work wonders with dandruff, then could it help with your baby’s cradle cap? According to bellybelly.com.au, the answer is a resounding yes! Though many natural substances still require caution when being applied to infants, coconut oil is generally deemed as safe. To be sure, check with your physician prior to use. Though there hasn’t been complete studies to attest to the safety of coconut oil when used on infants and toddlers, it also doesn’t seem like there have been any recorded adverse issues either. Therefore, if you do feel comfortable with giving coconut oil to your infant, there are many potential benefits. One of the major ways coconut oil can help your baby is with relieving their cradle cap. With coconut oil’s richly hydrating properties, it can be effective at treating cradle cap and preventing it from recurring. 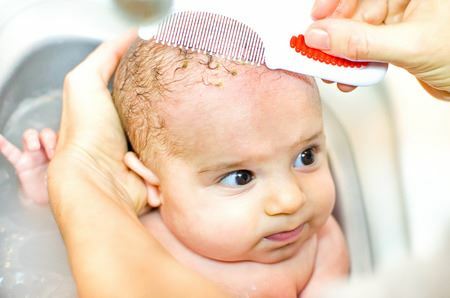 To use it for cradle cap, rub a dab of coconut oil into your baby’s scalp, gently massaging, and leave it to sit for about twenty minutes. Once the time is up, wipe away the excess oil with a cloth and use a soft brush to comb through their hair, removing any remaining skin flakes. Repeat as needed, though hopefully with continued uses, the need for treatments will lessen. Whether you are on a coconut oil kick, forgot to pick up more conditioner, or you’d simply just like to see how it works out, this oil can be used in place of your regular conditioner! Typically, coconut oil is used as a deep or leave-in conditioner, oftentimes overnight, however, it can also be used shorter-term as well. After shampooing as usual, start with about a nickel-sized amount of oil, and begin working it into your strands. Begin at your roots as you would with your usual conditioner and initially focus on just massaging it into your scalp. Once you’ve massaged your entire scalp, start pulling the oil through the rest of your hair, being sure to cover it all. If needed, use more oil, especially if you want to hydrate your dry ends. Leave it in for the rest of your shower, and thoroughly rinse at the end. Your hair may even be shinier than usual after this treatment! Coconut oil is, after all an oil, which means it will work quite well for getting out tangles, knots, and snarls! If you’ve ever combed your hair after letting coconut oil sit as a hair mask, you’ll know there truly aren’t any tangles to struggle through. The same concept applies to using coconut oil as a hair detangler, though with a far lighter application. A small amount goes a long way, so you’ll want to be extra careful with this approach as it’s very apparent if you use too much coconut oil on dry hair. If you use too much, odds are your hair will end up weighed down and greasy. To detangle your hair, start with a minuscule amount of oil. You can even slide a finger along the side of the jar to ensure you don’t grab too much. Rub the oil between your fingers and sparingly work it through the tangled areas. I would avoid using it in any other areas of your dry hair or there is a chance your hair will end up oily. Focus on working out those tangles with the oil on your fingers, and you should be able to brush through them in no time. Another tip: brush from your ends to your roots to help get tangles out. Brushing from the roots down will merely aggravate them. There is, however, a second option for detangling your hair if you are concerned about the risk of making your hair greasy by rubbing oil directly on the strands. If you have an empty spray bottle, you can dilute the coconut oil by mixing one tablespoon of oil with about a cup of water. This will easily spray on your tangled areas and greasy hair will no longer be an issue. 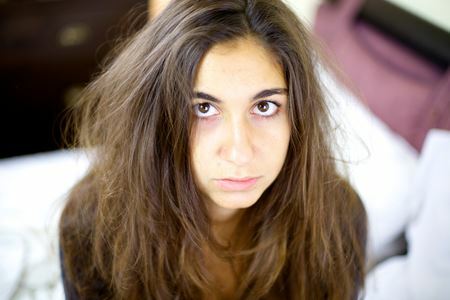 If you’re like me and deal with frizzy hair on a daily basis, then know you’re not alone. Frizzy hair is such a frustration, often ending with a basic hairstyle of a ponytail or bun because it’s otherwise unmanageable. 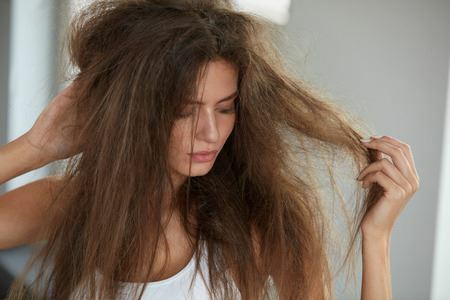 Even at that point, however, frizzy flyaways are still an issue! Without loads of hairspray, it seems like they just can’t be tamed. Product after product on the shelves claim success with frizz, and yet, we all know most of them are a joke. Tame this frizz? Probably not happening. This is one of the reasons why I love to use coconut oil on my hair: it truly does tame frizz and flyaways. The fatty acids in the coconut oil nourish your hair and help make each affected strand more manageable. To unlock this benefit, shampoo and condition your hair as usual. After towel drying, comb through your hair and identify the trouble flyaway areas. With less than one-fourth of a teaspoon of coconut oil, warm it between your palms until it melts. Using your fingertips, smooth down the flyaways and the trouble frizz sections. The key here is to hardly even touch your hair; with light hands, just smooth the flyaways. Try not to touch the rest of your hair to prevent oily, weighed down strands. Who could go for a scalp massage right about now? I certainly know I could, pretty much anytime, any place! Though scalp massages are the best way to usher in relaxation, this luxury often brings with it frizz and static in your hair. Don’t let that stop you though because coconut oil is a fantastic scalp massage oil. There are numerous oils on the market aimed for massages, but they are typically overpriced and underwhelming. We already know how coconut oil can help with scalp dryness, dandruff, hair damage, hair growth, and stimulates follicles, so why not use it as a massage oil? Though it solidifies at room temperature, it instantly melts at the touch, which makes it ideal for keeping down on the static during a massage. Our suggestion for using coconut oil truly depends on your purpose for it. If you have the time and availability for a hair mask in your schedule, feel free to use as much oil as you’d like for the massage, and then just work it through the rest of your hair as a mask. However, if you’re aiming for only a massage and not a mess of oily hair, use the coconut oil sparing. Again, try just dabbing a little from the side of the jar. We hope you enjoyed this list of benefits and uses of coconut oil for your hair! Please let us know in the comments what you liked the most or how you think you’ll use coconut oil for your own hair! I have personally been at the point where I felt like I have tried all the products under the sun for treating my dry scalp and frizzy hair, which made coconut oil such a fantastic option for me when I heard about it. I didn’t need to look any further than my own kitchen for the answer and I could save money while I was at it! Keep in mind that each person reacts to products differently and these benefits may work for one person, but not the next. It truly has made such a difference for me, so I hope it does for you as well. If you found this article helpful, please feel free to share it with your friends! 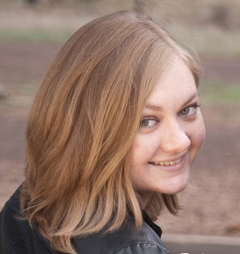 Tialla Rising is a freelance writer living in the mountains of Arizona with her wonderful husband and their two fur-babies, a cat and a dog. She has loved reading and writing for as long as she can remember, even self-publishing two novels as a teenager. She loves going on adventures with her husband, though a cozy book, a stormy day, and a coffee also comprise her favorite moments.